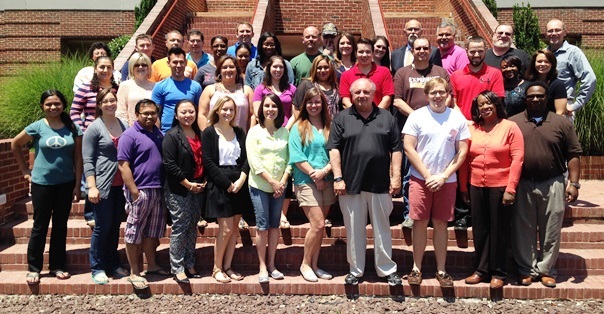 Thirty-five NFFE-IAM members attended a first-of-its-kind Young Federal Leaders training at the William W. Winpisinger Center in Southern Maryland. NFFE-IAM members from around the country came together at the William W. Winpisinger Education and Technology Center to take part in the first-ever Young Federal Leaders (YFL) training. The first-of-its-kind young worker training introduced the 35 rising stars within the union to the countless resources and opportunities available for their development as leaders, including the Winpisinger Center. Over the course of three days, young members and union leaders learned about the history of the IAM and NFFE-IAM, while also being introduced to the educational, mentorship and leadership opportunities within the union. Kicking off the class were NFFE National President William Dougan and IAM General Vice President Diane Babineaux. They welcomed the young workers and expressed their commitment to developing the next generation of labor leaders. Topics covered in the training included a labor history, recruiting new members, political and legislative advocacy and how to start a YFL chapter. Class participants were also introduced to the numerous ways to become involved in local labor communities, including AFL-CIO Central Labor Councils, State Councils of Machinists and AFL-CIO State Federations. Class participants were encouraged to seek out and get involved with the young worker groups associated with these local labor communities. Following three days of in-depth training, class participants were energized and ready to dedicate themselves to organizing and empowering the next generation of labor leaders. The young workers returned to their locals with strategic plans, equipped with the necessary tools to usher in a new wave of young unionists. The NFFE-IAM Young Federal Leaders class was the first in a new series of young-worker oriented classes being offered at the Winpisinger Center. The next young workers-oriented course will be the Young Workers Strategy Program, held at the Winpisinger Center August 3-8, 2014. While the class has reached capacity, interested NFFE-IAM members can be added to the class waitlist in hopes of securing a spot if a registrant is unable to attend. For more information about the Young Workers Strategy Program, or any other class at the Winpisinger Center, contact the center at (301) 373-3300, or visit their website here.